When you think of Northern Italy, what comes to mind is fine food, medieval cities and rustic scenery, not necessarily high-end stereo equipment. Yet, just outside Piza, Italy, the company, North Star Design has been manufacturing excellent digital gear for the last 15 years. Their latest DAC, the USB dac32 at $3,000, combines the management of audio streams up to 192kHz, 32 bit and a dedicated hi-speed USB port which allows this DAC to be driven by your computer as the music source. Many DACs offer a USB input because so many music lovers now have their collection stored on some form of hard drive on their personal computer. The difficulty is that many of these DACs suffer because the USB input often picks up noise/jitter that contaminates the bit stream from the computer's power supplies and fans. Let's see what level of performance the North Star Design USB dac32 can offer when driven by one of the highest regarded dedicated transports, MBL 1621A, then compare this when driven by a computer front end source. • Read more DAC reviews in our Source Component Review section. • Find a pair of Bookshelf Speakers or Floorstanding Speakers to pair with the dac32. The North Star Design USB dac32 is finished in your choice of silver or black. The build quality is at a high level. This DAC is rather petite at 11 and a half pounds and measuring 17 inches wide by two and a half inches deep as well as tall. The front panel only has a standby button along with LED's that indicate which input is in use along with selector buttons to change from one input to another input. The rear panel offers many options such as coax input, optical input, balanced input (AES/EBU), USB input, 12s input, unbalanced RCA output, and balanced XLR output. Finally, there is an AC mains inlet and AC mains switch. The USB dac32 offers innovative strategies to overcome the noise/jitter that often leads to inferior performance when being driven by a PC or Mac front end. The USB dac32 can play audio files with frequencies up to 192kHz and 32bit. Through the USB input, two measurements are used to keep the digital bit stream "pure," which results in the resynchronization of the incoming data while isolating the electrical interference from the computer. The first option allows you to disengage from the transmission timing imposed by the USB. Using the on-board reference oscillator with low jitter of the DAC is capable of clocking the data coming from the computer with absolute precision. The second solution allows the USB dac32 to completely isolate the noise of the computer from the DAC, thus allowing the transmission of signals at high speed without any grunge generated by the computer. Many solid state DACs that are priced from $1,000 to $3,000 offer excellent transparency and micro details. Along with these virtues, these DACs can have good, punchy bass and dynamics; however, for my taste, they are not overtly harsh or bright but are somewhat lean-sounding, lacking 3-D images with air around each player. They also leave something out in the areas of timbres and overall tonality. Brass instruments just don't sound "brassy" enough and bass fiddles lack some of the "woodiness" you hear in real life. The USB dac32 offered excellent clarity, details and had a very powerful, tuneful bottom end and silky extended highs. It throws a very deep soundstage in all directions. What surprised me the most was in the areas of timbre and tonality. This DAC competed very favorably with much more expensive pieces. Overall, the USB dac32 is slightly warm in its tonality with a higher level of natural timbres than other DACs that it competes with. Compared to my reference DAC, Concert Fidelity DAC-040, the USB dac32 is not quite in that stratosphere of reference level performance, but then you are comparing a $3,000 piece to a $10,000 reference handmade DAC. Regarding how the USB dac32 performs when driven by the USB input compared to the coax input and transport, I could not tell any significant difference in its sonic performance between the two inputs. This is very important because most music lovers would be driving this DAC with a computer front end. 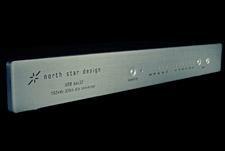 Read about the high points and low points of the North Star Design dac32 on Page 2.